Oboist Shawn Garrone, board member of Music at Bunker Hill, performs a Junior Recital at Rowan University’s Boyd Recital Hall on November 10, 2018 at 7:00pm. Garrone will present Madeleine Dring’s Trio for Flute, Oboe, and Piano; J.S. Bach Oboe and Violin Double Concerto; Vaughan Williams Oboe Concerto; and Vivaldi Double Oboe Concerto with string quartet. The theme for this recital is “Double Concertos”; a musical piece featuring two soloists as well as accompaniment. Pianist Stanley Delage accompanies Garrone for the majority of this recital while Antonio Vivaldi’s double Oboe Concerto shall be accompanied by String Quartet featuring students at Rowan University. Garrone studies oboe with Dr. Mark Snyder and presents this free concert. Garrone and friends welcome all attendees to a delicious reception after the concert. Suzan Preiksat has expanded her porch metamorphosing station, pictures below. Overflow for those who attached to a leaf instead of the cage. 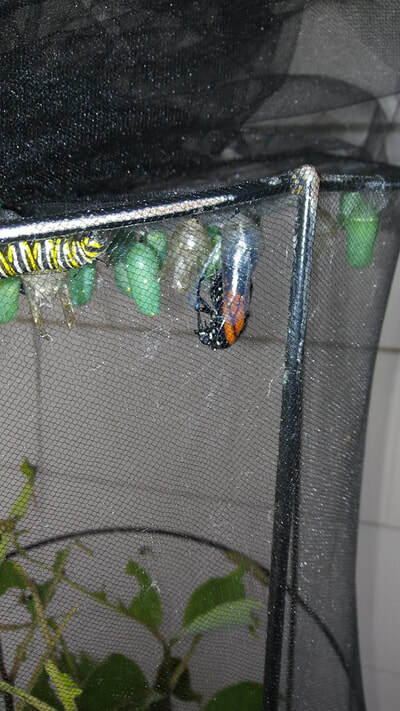 Watch Suzan's record of the emerging butterfly. How does it fit in that little capsule? 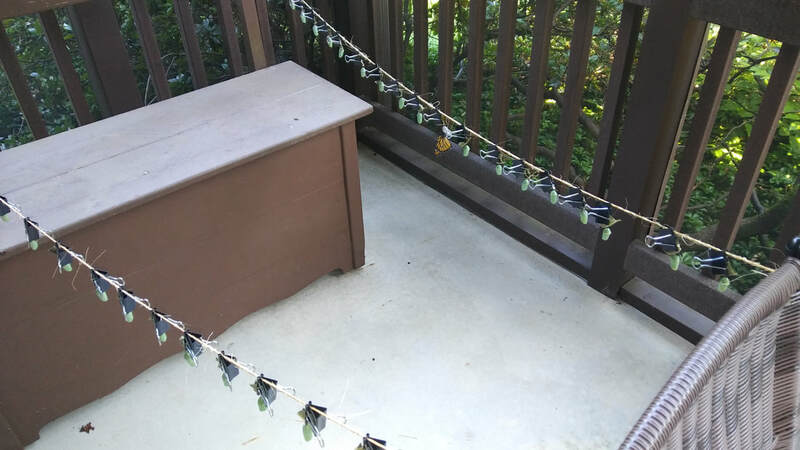 Board member Suzan Preiksat knows that Monarch butterflies and other insect populations are on the decline because of loss of habitat and pesticide use, so she raises them on her protected front porch and releases them when they mature. Suzan's yard has several flower "meadows" which are planted with inviting flowers and host plants. 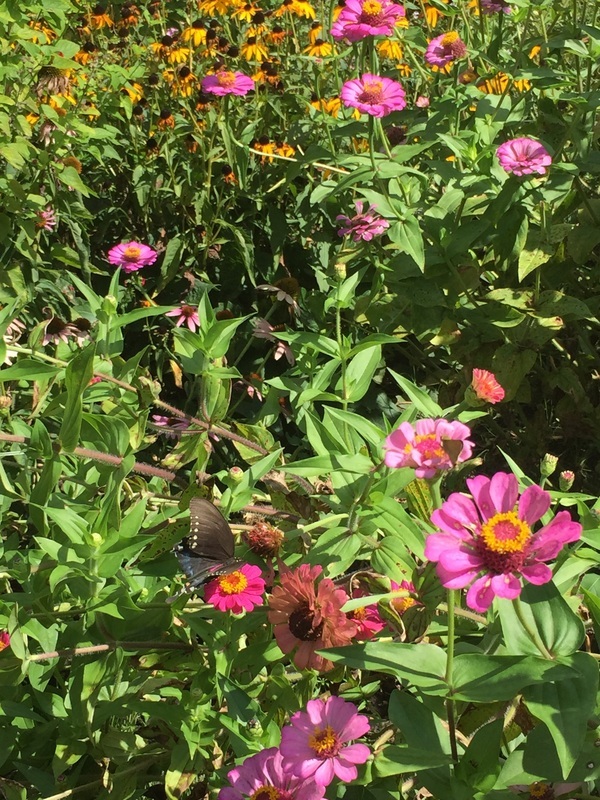 On a mid-August day the meadows were filled with little white butterflies and several Black Swallowtails (right) plus the occasional hummingbird. 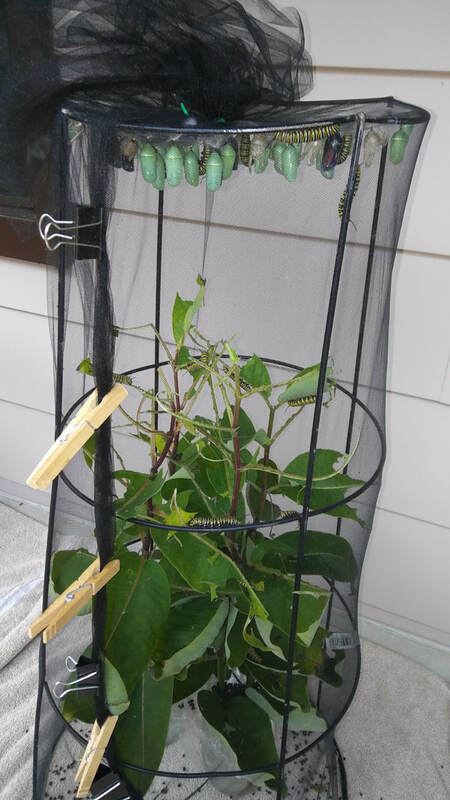 She has used tomato cages and tulle netting to create a safe place for the Monarchs and Swallowtails to develop on the screened porch. 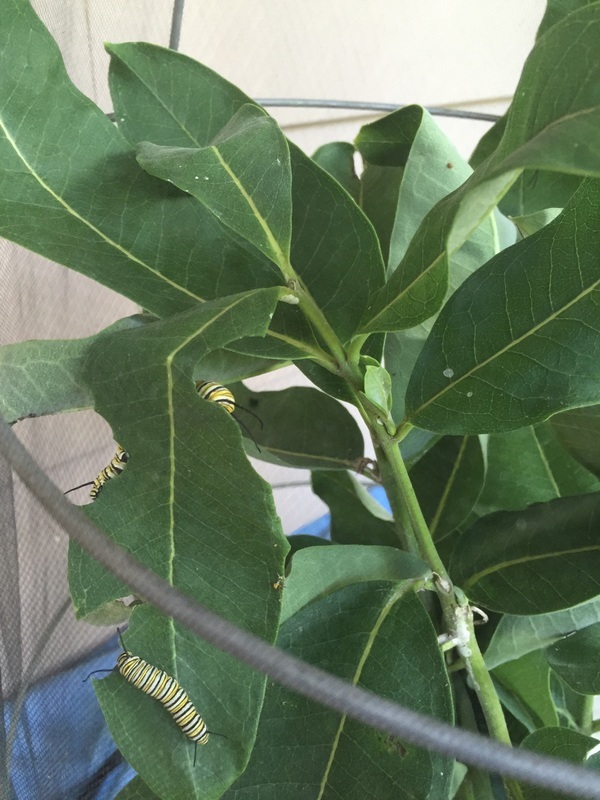 The Monarch caterpillars first appear on the front yard Milkweed plant and are relocated by hand to the safety of the porch. 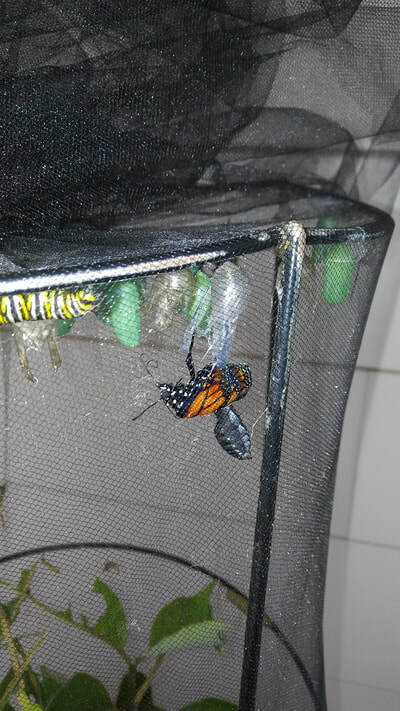 They devote about a week to eating Milkweed leaves from plants that Suzan has cut and placed in the cage. When the time is right, the caterpillars climb up to the top of the cage. 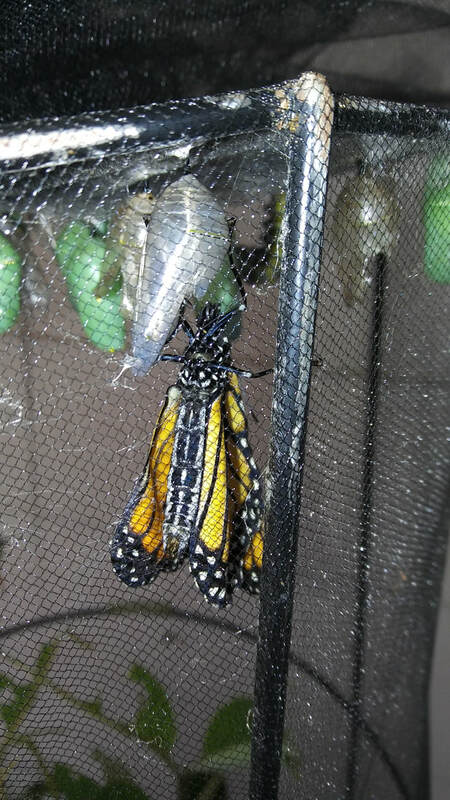 They shed their outer striped skin and form a chrysalis that shelters them for 10-14 days as they transform into butterflies. 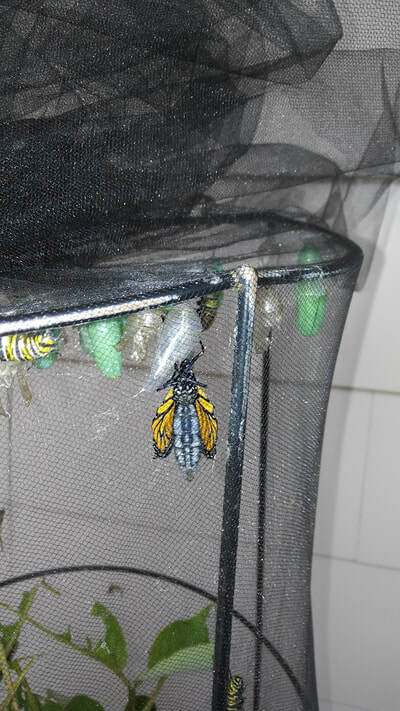 Here is a Monarch who has just emerged from its chrysalis. 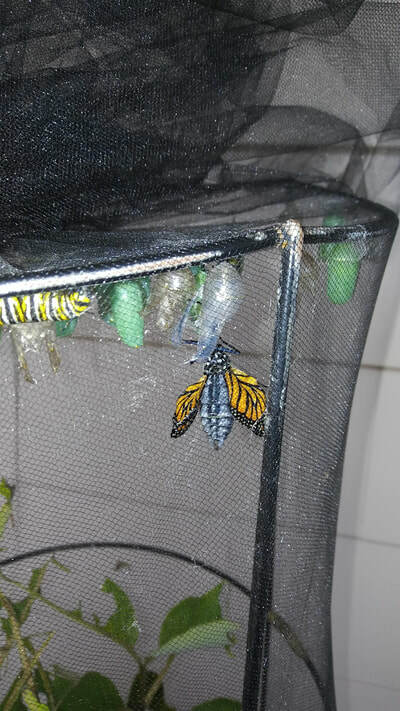 Wings must dry for a few hours before Suzan releases the butterfly into her meadow. The new insect takes to the air and feeds in the garden. Early in the season, the butterfly will nectar on garden plants and lay eggs. 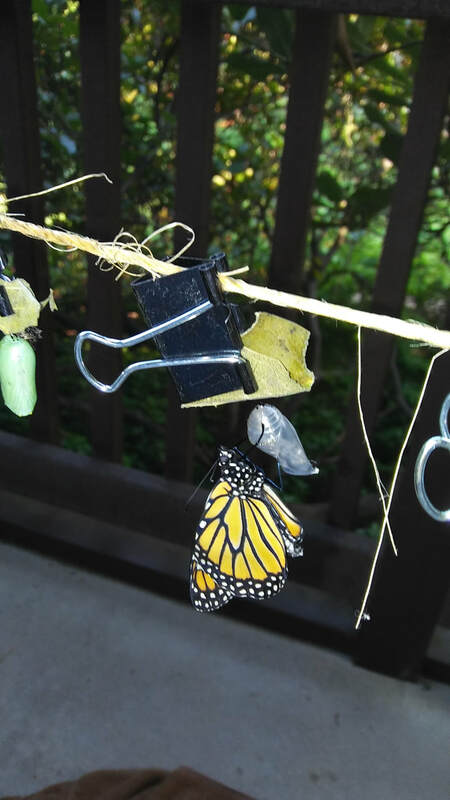 Butterflies that emerge after mid-August will nectar, then fly south, guided by an instinct that is hard-wired into the amazing insect brain. Black Swallowtail caterpillar on fennel (above), mature Swallowtail on Penta (below). Why does she do this? 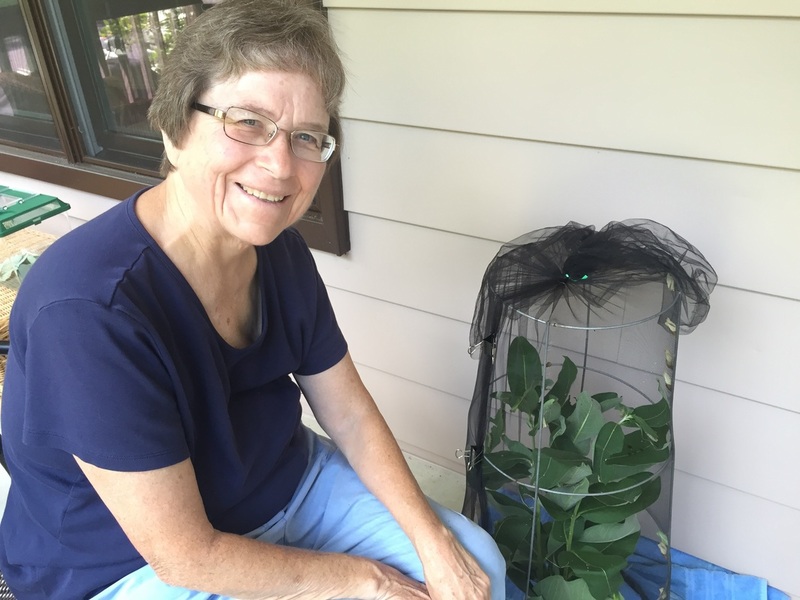 Suzan is passionate about butterflies, bees and other pollinators and wants to do her part to nurture these creatures that come across her path. She invests a lot of time and energy into learning how to create an inviting landscape and "raising" the insects that happen by. She knows that declining populations need some help from their humans. She participates in the Gloucester County Nature Club, link below.